Eusing Launcher: Free application launcher and icon manager - Spyware FREE. If you are a Windows user and have a lot of icons placed on the desktop, it may be really difficult to find a certain icon and manage all of them. There is a better way of organizing all your icons on the desktop, using a powerful launcher. Eusing Launcher practically organizes all the desktop icons in the shape of a circle, allowing you to easily and quickly find any desired icon. Eusing Launcher includes some predefined icons added to its interface, but the user can add virtually any program shortcut to it. You can access any program or Windows feature in the shortest time possible and with great ease. It also allows quick access to your Windows system directories and Windows accessories. Drag-and-drop operations are supported for adding the shortcut or program. You can select the maximum number of icons that should be displayed. Besides that, the opacity level and size of the icon circle can be customized. Furthermore, the program's settings and the list of icons can be backed up as a file, for reusing it later on. No matter how many windows are open, you can use the hot key to bring Eusing Launcher to the top. With Eusing Launcher on your system you can easily organize all your icons and set them up in any way you want, and arrange them according to your wishes and needs. This way you will always have a reliable application that will enable you to organize your work space. 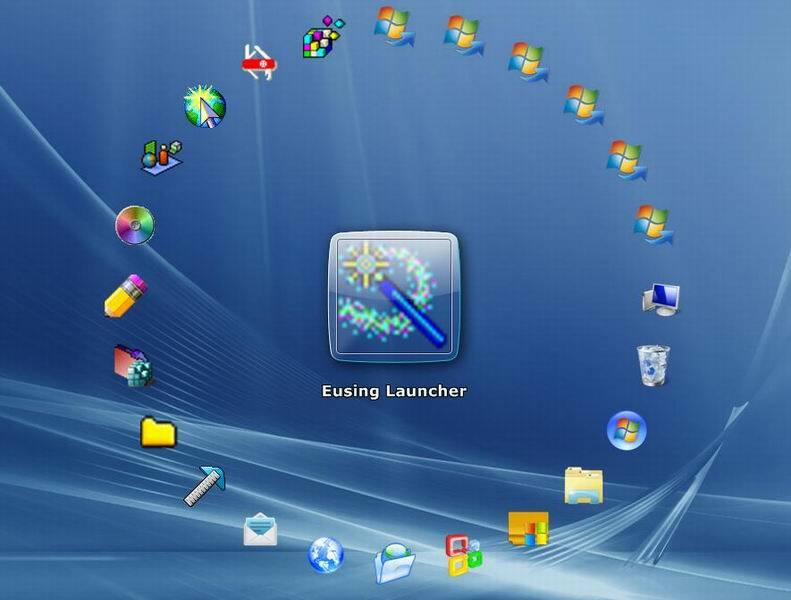 Eusing Launcher is a freeware product, this means that you can download and use it for free. Anyway we will appreciate contributions: we will use collected money to finance new development of it. Without your support, perhaps we can't keep adding new features. Thanks for your help. Eusing Cleaner - System tools like registry cleaner, disk cleaner, and internet track eraser. Free CD to MP3 Converter - A free CD ripper to rip audio CD and convert to MP3, Wav, Ogg or Wma.